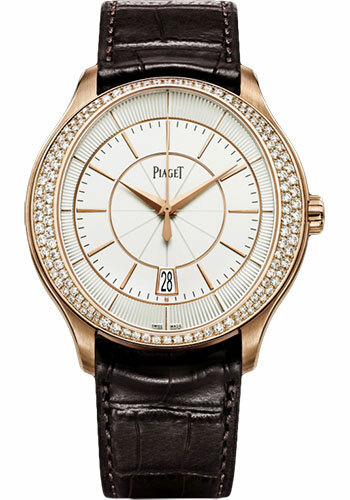 43 mm 18K rose gold case, sapphire back, bezel set with 128 brilliant-cut diamonds (approx. 1.4 ct), silvered dial with 18K pink gold hour-markers and date window, caliber 800P self-winding mechanical movement with hours, minutes, central seconds and a date window at 6 o'clock, approximately 85 hours of power reserve, brown alligator strap, ardillon buckle. Water resistant to 3 atm.